‘This is the African Grand Canyon,’ says Dejen, our guide, as I peer cautiously over the craggy lip of the rocky precipice. I can’t even see the ground below. The volcano chiseled Simien Mountains spread toward the horizon, eventually seeming to crumble into the khaki desert of neighboring Sudan. A lammergeyer soars through two massive plugs of freestanding rock, pursued by a vocal trio of thick-billed ravens. It’s barely a dozen steps back to the Land Cruiser, but I’m already gasping for breath, my lungs overtaxed, unaccustomed to the altitude. The three day, 40-kilometer trek we are about to embark on suddenly seems far more formidable. I look over at my friend Andy, a former resident of Ethiopia, and my Addis Ababa-based sister Lisa and her husband Mike – even used to living at nearly 2,300-meters—they are all panting too. I grab my pack just as the engine rumbles back to life. 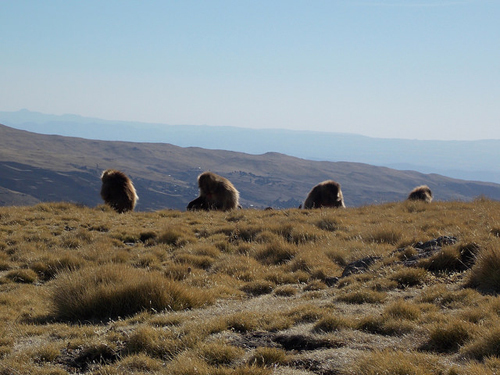 Behind us, a group of Gelada baboons has congregated along the roadside – the largest, a formidable male with a tawny, lion-like mane, sits dexterously plucking slender blades of grass from the soil, watching apathetically as our vehicle disappears into a cloud of dust. The Simiens are one of Africa’s largest mountain ranges – and also certainly one of the continent’s most striking – a mosaic of plunging escarpments, alpine plateaus, craggy rock spires and soaring 4,000-meter peaks. At first, other than the Geladas, it almost feels as if we have the entire 412-kilometer UNESO World Heritage Site to ourselves. But, that is hardly the case. A World Heritage Site since 1978, Ethiopia’s Simien Mountains National Park has also been classified as a ‘World Heritage Site in Danger’ since 1996. Pressure from communities living in and around the park has taken an environmental toll. Forests have been cleared for firewood and vast areas of the park have become a patchwork of slash-and-burn agriculture. Steep hillsides have been carved into terraced steps for the cultivation of tef, sorghum, and maize. Domestic animals are another problem. Large tracts of the national park – particularly near areas of human settlement – are overgrazed. Domestic animals not only put pressure on the dwindling resources utilized by the wildlife – but also create other conservation challenges for the park’s endangered endemic species. Livestock and domestic dogs are a vector for transmitting deadly diseases to park wildlife and have even been observed hybridizing with some of the rarest endemic species in the SImiens – walia ibex and Ethiopian wolves. Recently, a new population has also started increasingly descending on the park – tourists. 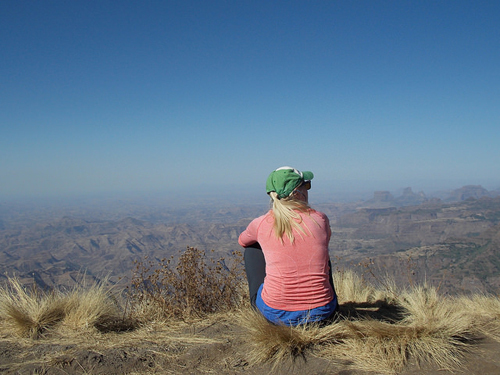 Barely a decade ago, tourism in the Simiens was almost unheard of. In 2007, the national park had only 5,000 visitors. But, things are changing. ‘Backpackers are coming, mostly Europeans,’ says Shiferaw ‘Shif’ Asrat, a longtime senior park guide and owner and founder of Simien Trek, when he picks us up at the airport in Gondar earlier in the day. As we speed toward park headquarters in Debark to collect Tafere, our government-mandated, gun-toting scout, we must stop regularly for flocks of goats and sheep heading to market and donkey-drawn carts, passing villages fringed by clumps of eucalyptus and colorfully painted roadside stalls. 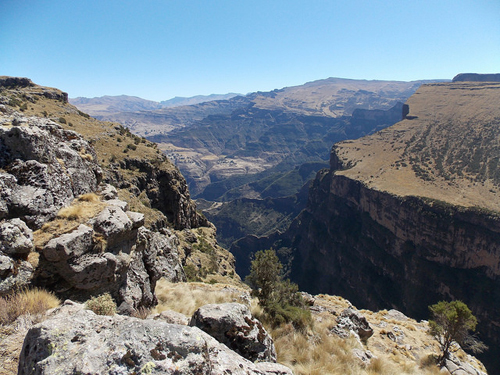 Shif tells us about his latest project – the Limalimo Lodge – a 14-room luxury eco-lodge being built on the Simien escarpment slated to open in the fall. ‘We are just putting up the walls. They’re rammed earth. Really beautiful,’ he tells us. Shif and his partners are taking painstaking efforts to make the lodge sustainable. Part of the funding for Limalimo is being furnished by African Wildlife Capital, an investment company owned by the African Wildlife Foundation providing funding for private-sector initiatives with the potential to benefit conservation efforts and local communities. In addition to the rammed earth walls, Limalimo will rely on renewable energy, recycle wastewater, and replant the grounds with native species. But, for communities living around the national park, the new lodge will provide something even more important – employment. Local residents have not only been hired for the construction phase, but are also being trained as fulltime staff—nearly 60% of Limalimo’s employees will come from nearby communities making the lodge a significant source of livelihood in a place where opportunities are few and far between. Even with the promise of a new luxury lodge, for locals, the fiscal benefits of the burgeoning tourism in the Simiens will take time to trickle down. When Limalimo opens in the autumn, it will still be only the second lodge operating in the national park. 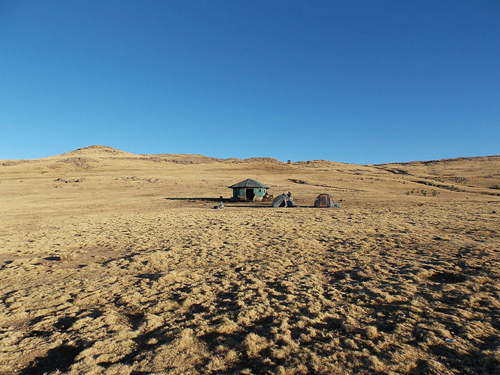 Reaching our first camp – 3,250-meter Sankabar – fortunately doesn’t involve much elevation gain. Instead, we parallel the edge of the escarpment, following a trail studded with moss-draped heather and stocky rhododendron. A pair of Klipspringer pogo into the bush as we wander through a meadow of fragrant, violet-tinged wild rosemary. Later, as we sit sipping tea and eating warm popcorn, a chestnut colored Menelick’s bushbuck wanders timidly through our camp. ‘What about walia ibex?’ Andy asks Dejen. Found only in the Simien Mountains, the stocky, bearded ungulates were nearly extinct when the national park opened in 1966 – and although still classified as critically endangered, walia ibex numbers have started to recover after plummeting in the early 1990s during the civil war in Ethiopia. ‘We will see them,’ Dejen promises. Our second day begins with a precarious descent. We start out hiking through tunnels of drooping, dew-coated heather, finally stumbling out of the dense forest late morning. The view is striking – soaring turrets of rock dominate the landscape. The cliff face below seem impossibly steep, but the rock is scarred with hoof-chiseled trails, and a troop of Geladas is scattered over the vertical precipice. We detour to Jinbar Waterfall, tumbling like a shimmering silver ribbon nearly 500-m to the valley below. 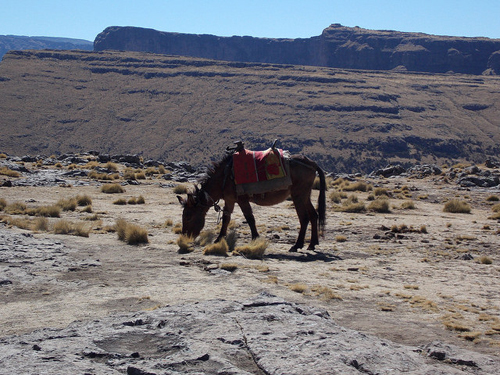 In the afternoon, we climb, heading toward one of the park’s remaining villages – Gich – constantly stepping aside for parades of livestock driven by switch-toting youngsters. The Muslim village of Gich is a collection of conical, tukul-style huts, sprinkled over the hillside – and also one of the most degraded areas of the park. Despite government efforts to resettle populations living in the park, Gich’s population has grown in the last half century – nearly tripling between 1967 and 2006. But the lack of livelihood opportunities and persistent threats to food security have also taken a toll on the village’s population – many of the Gich’s young people have left to look for jobs in Sudan, Dejen tells us. In the village, we make arrangements to purchase a rooster for dinner – a stringy bird all muscle and ligament, but here, this much protein is a luxury. We camp above Gich – at 3,600 m – on a sandy plateau reminiscent of the steppes of Tibet. After dinner, in the moonlight, I can’t help asking Dejen about the park’s predators. The Simien Mountains are home to a number of formidable carnivores — common jackals, spotted hyenas, leopards, and the rarest canid on the planet, the Ethiopian wolf. There are only estimated to be about 100 of the wolves left in the Simiens, but Dejen tells us in his six years guiding in the national park he has seen wolves – and a number of leopards. Our last morning, we begin the final 20-km haul, leaving camp early, while the mountain streams are still crystalized with ice. We begin weaving our way across a vast plateau sprinkled with giant lobelia and cottony bunches of everlasting flowers, ‘They bloom and last forever,’ Dejen tell us, gesturing to the flowers. The perfect Valentine. Suddenly, Lisa stops and points to a rust-colored speck in the distance. We freeze. I can just begin to make out the shape trotting toward us – it’s a lanky, coyote-sized canine. 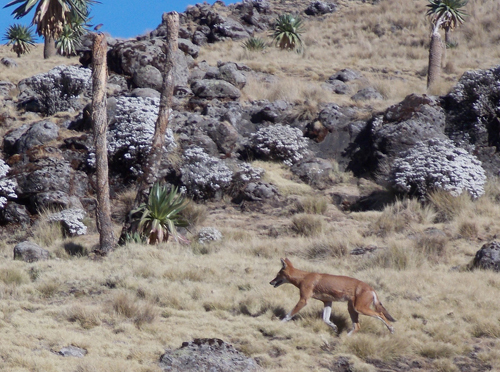 An Ethiopian wolf. Fumbling for my camera with numb, icy fingers, I can’t believe our luck. The wolf jogs past – with purpose – not even giving us a glance. But then, barely 30-m away, the wolf stops abruptly, crouching cat-like beside a scruffy clump of tussock grass. Suddenly, the wolf pounces, and immediately emerges from the thicket, a giant mole rat dangling limply between its jaws. Sometimes falsely branded as pillagers of livestock, Ethiopian wolves actually rely primarily on rodents for food – a trait which makes the wolves unique among other canids, and allows them to survive in the protein-scare Ethiopian highlands. 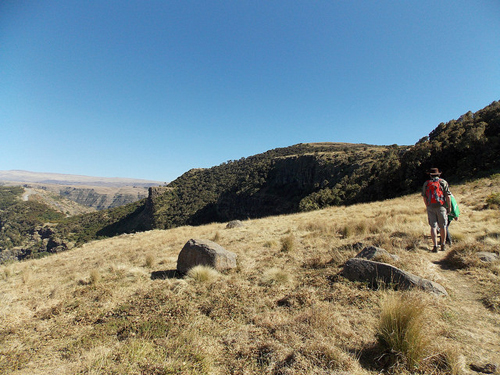 In the early afternoon, we climb to the highest point of our trek – 4,070-m Intaye. As we stop for lunch on the craggy massif’s sunbaked rocks, my eyelids become heavy, and I immediately doze off. But, the day is hardly over – after a cat nap, we begin our last push, descending a boulder-strewn hillside to our final camp at Chenek, nearly 450- m below. Just before camp, Dejen gestures to a rocky ledge and we scramble up, my knees stubborn as unoiled hinges. We peer into a verdant, tree-lined canyon. ‘This is where we see them, the walia ibex,’ Dejen says. We scan for movement below but see nothing. Shadows are beginning to creep up the deep ravine as the late afternoon sun slides toward the horizon. Minutes later, at camp, as Andy and I hover over steaming bowls of water, scrubbing our dust-crusted hands, Tafere comes rushing toward us, gesturing emphatically. We follow him down the trail, stumbling in the spreading darkness. There, at the edge of camp, are three walia ibex, barely visible in the twilight. They are impressive creatures – large and stocky – like drawn out bighorn sheep, cartoonish goatees sprouting from their chins, formidable, ribbed horns curling from their foreheads. We watch the ibex graze as daylight fades. After a few minutes, the largest male spins around to face his companions, they fall into line obediently, and all three ibex follow the trail of moonlight into the night.